As I was completing work on The Year of Goodbyes, the Holocaust Memorial Museum in Washington, D.C. became the U.S. depository of millions of documents from what had previously been the largest closed Holocaust archive in the world. 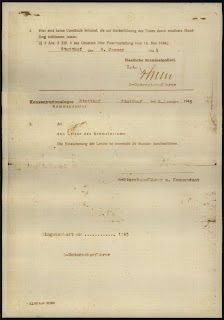 The archive, called the International Tracing Service, was established by the Allies at the end of World War II in Bad Arolsen, Germany. In 2008, the ITS made its archive available to the U.S. 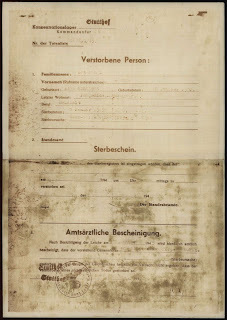 Holocaust Museum; the Museum then allowed survivors and their relatives (like me) to file requests for Museum researchers to search the archive for information on specific individuals. I filed a big batch of requests in January 2009 and started getting responses about two months later. For the most part, the newly opened archive did not produce any revelations about the people in The Year of Goodbyes. There was one significant exception. That exception related to Manja Stahl, my mother’s first cousin from Pabiance, Poland. She created this page ("Have a heart! Look into a heart!") 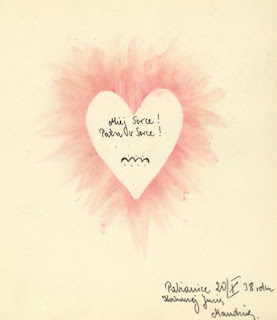 for my mother’s poesiealbum when my mother last saw her in Pabianice in October 1938. At the time my mother, Jutta, was almost 12 and Manja was 18. My mother just adored her older cousin. Our family had been somewhat uncertain about what had happened to Manja. Someone said she died in the Lodz Ghetto. But two relatives who were imprisoned in the Auschwitz concentration camp with Manja said she died there. This was what members of my family believed for more than 60 years. 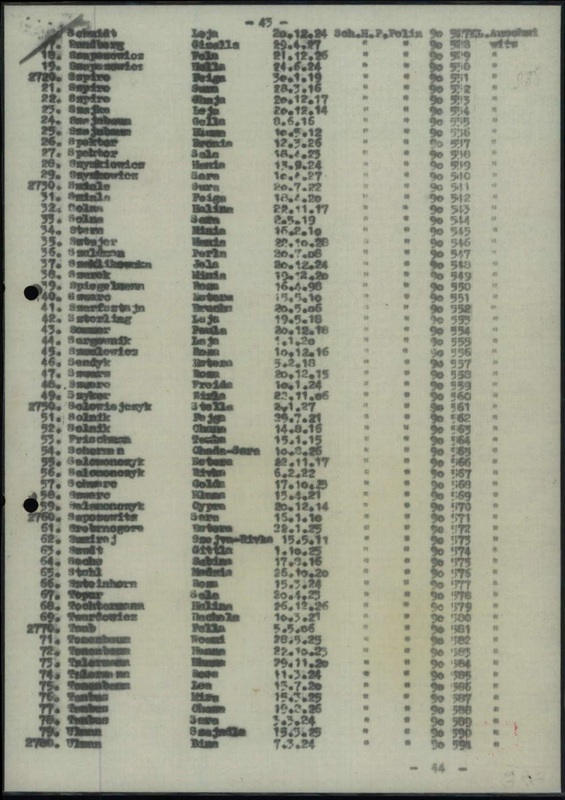 The names are blurry, but Manja's is visible about 3/4 of the way down the page, along with her birthdate (October 26, 1920) and prisoner number. 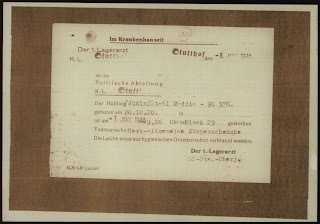 And here is a document from the Stutthof camp “doctor” declaring Manja dead on January 7, 1945 from “complete body weakness” in block 29 of the camp. The form also mentions that her body was cremated for “hygienic” reasons. By the time I obtained all this information in 2009, The Year of Goodbyes was going to press. I was able to change the statement that had been in my original manuscript asserting that Manja died at Auschwitz; the book correctly puts her place of death at Stutthof. But I could not add the other details described here. It was, and remains, so unsettling for me to think about these details. I already knew that this young woman died at the hands of the Nazis. Why, then, are these new details so agonizing? 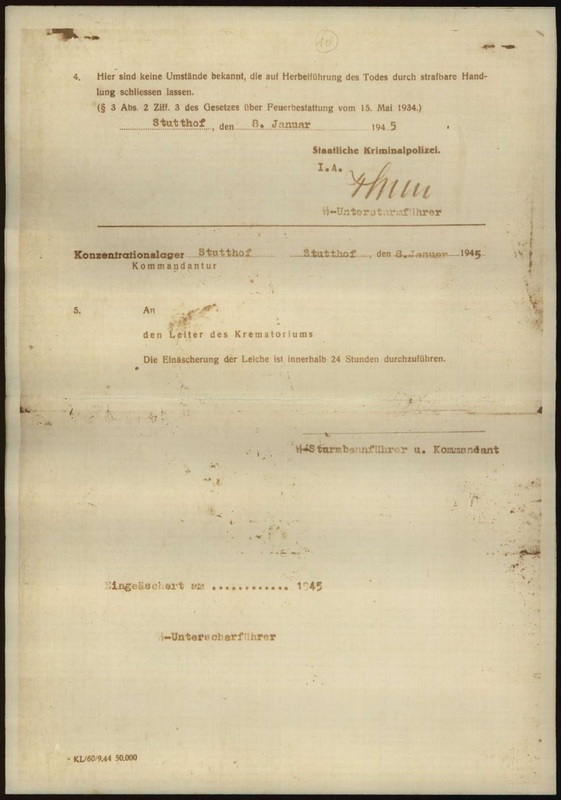 Because—to think of Manja actually surviving Auschwitz (where her mother died) and then being shipped hundreds of miles north to Stutthof. . . . And to think of Manja surviving until January 1945, with the end of the war only four months away. . . . 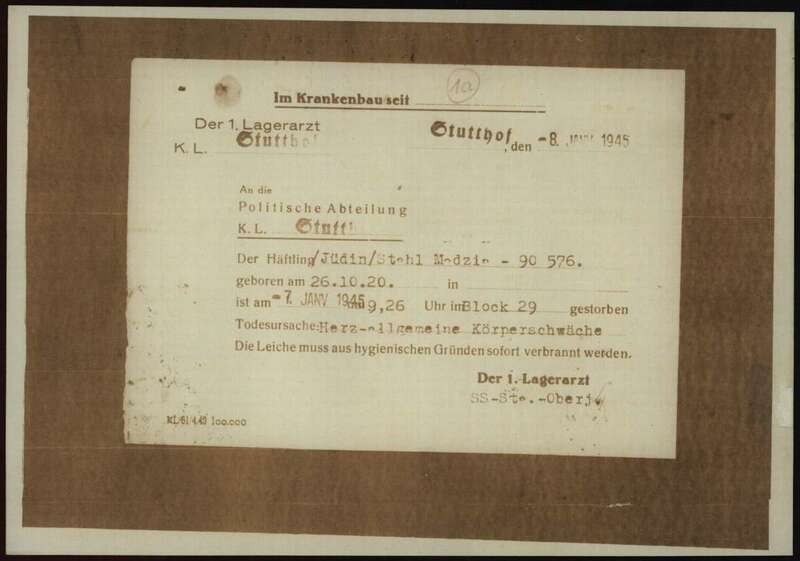 But Manja’s death from “total body weakness” in the camp may have been a blessing of sorts. 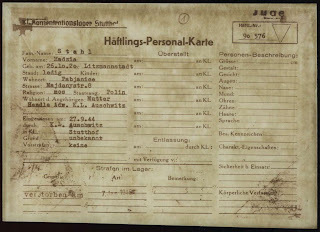 The Nazis conducted forced evacuations of Stutthof as the war’s end neared, starting around the time of her death. Thousands were marched into the Baltic Sea, where they were shot. Thousands died from the harsh winter conditions in which they marched. 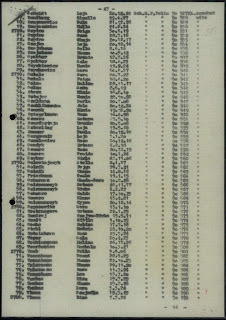 In January 1945, there were 50,000 prisoners at Stutthof. When Allied forces liberated Stutthof on May 9, 1945—it was the last camp to be liberated—they found a total of 100 surviving prisoners. 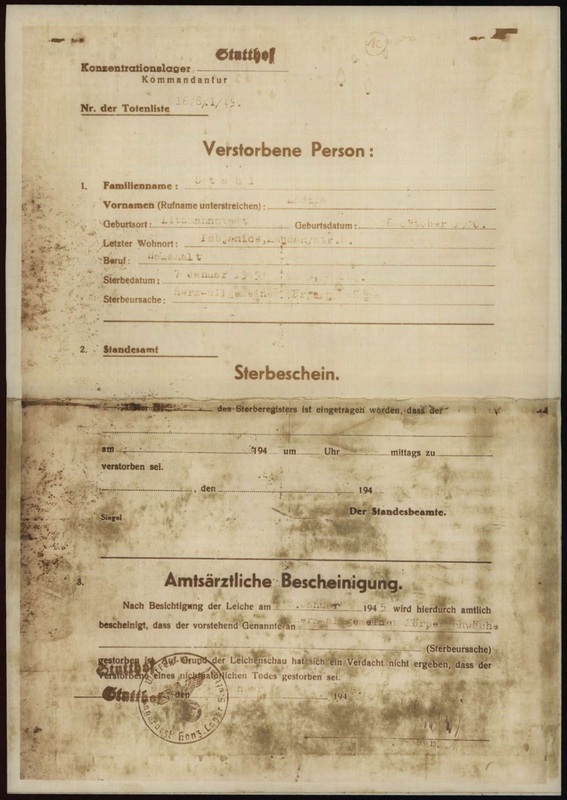 Manja Stahl died in the Stutthoff concentration camp 67 years ago today. She was 25 years old.